We look forward to seeing our regular visiters to the studio and welcome new faces to our studio. The day will be a relaxed informative day with some really talented photographers showcasing their work along with some practical demos. We welcome Duncan Cooper, Regional Account Manager from Calumet to the studio. Duncan will be bringing some of the latest best selling pro equipment on the market today. We also look forward to Fyzal Kirk ABIPP, the BIPP North East Wedding Photographer of the year 2011. Fyzal will be bringing along his successful associateship panel for you to have a look at and he will be around to answer and questions you may have. This is a must for anyone in the very competitive wedding sector to see. We also have Russell Baston FBIPP around to answer any questions about joining the BIPP and how to gain qualifications within the Institute. Students are particularly welcome to come along for advice. A hands on lighting demo from Karl Shaw and one of our fantastic Bohomodels to shoot. Karl has had a career in the design industry and is also a regular contributor to Professional photographer magazine and other publications. He will be doing a practical demo on lighting and you will have the opportunity to shoot the models after the Demo...so bring your camera. We will also have a Kino Flo lighting set up , as used by David Bailey and Rankin. We will have the Hassleblad H3 D39 set up tethered and you can Shoot another of our Bohomodels on this set. A finally we will have an exclusive exhibition of 9 original publicity posters from the 1975 Private collection Helmut Newton....a must to see. 10.00am Open . We will have several photographers on hand to answer any questions you may have in a very relaxed informal area. Welcome to the WORLD famous Bananastudio Free Open Day. We are delighted to welcome Calumet the UK's leading dealer of professional photographic equipment. Calumet will be showcasing some of the latest equipment and you will have an opportunity to speak to the Regional account manager for any equipment questions you have and the chance to purchase some new equipment for christmas!!! We will also have lighting demos from our guest photographers and we welcome Fyzal Kirk North East BIPP Photographer of the Year 2011 and Wedding Photographer of the Year 2011 with a sample of his portfolio, and will be around to answer any workflow and editing questions. We will have a lighting demo with model from Karl Shaw a highly respected local photographer and designer who also regularly contributes to Professional Photographer magazine and other publications. Professional models from Bohomodels will be available for shooting in the lighting set ups and help and advice will be available and a chance to shoot on Hassleblad H3 D39 on the day in the regions leading studio. We also have Bowens , Lencarta and continuous lighting for use on the day. 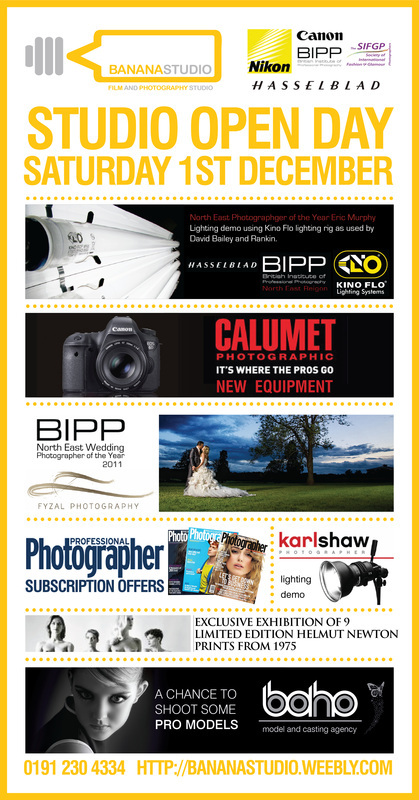 We have subscription offers from Professional Photographer magazine available on the day. We welcome students , amateurs and professional to our Open Day. A Bananastudio student discount card will also be available to all photography students in the area which gives discounted hire rates and workshop rates. 1975 " Private Property" on display in the studio, a great opportunity to see some of the maestros work. These are original 1975 publicity posters limited editions. FREE refreshments tea , coffee , wine and soft drinks and nibbles will be available throughout the day. We look forward to seeing some old and new faces and in particular the local students of photography at this event. If you have been to previous open days at the studio then you know we always have a great day in a great studio.